State oil giant Saudi Aramco said its trading subsidiary, Aramco Trading, has signed an agreement with Poland’s leading refiner, PKN Orlen for the supply of Arabian Crude Oil in exchange for a similar volume of high sulphur fuel oil from the Polish refiner. 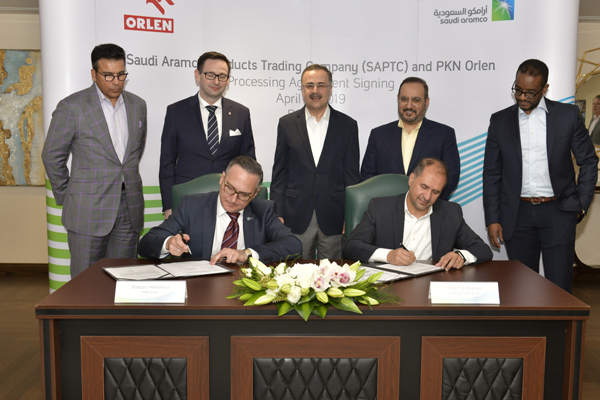 The agreement was signed by Aramco Trading President and CEO Ibrahim Al Buainain and Executive Director of Trading Grzegorz Markiewicz from PKN Orlen in the presence of Saudi Aramco CEO Amin H. Nasser and PKN Orlen CEO Daniel Obajtek at a ceremony hosted by Saudi Aramco at its Dhahran headquarters. The agreement paves the way for a further expansion of Saudi Aramco’s well established partnership and collaboration strategy while diversifying PKN’s crude oil supplies and securing new outlets for their products, it stated. The increasing number of strategic partnerships established across refining, chemical and marketing activities reinforce Saudi Aramco’s downstream growth ambitions and bolsters its successful efforts to span the length of the value chain. The increased European presence also positions Saudi Aramco favorably to supply critical feedstock to the European market.